In today’s feature we take a look at infielder Dan Gamache whom the Pittsburgh Pirates selected in the 6th round of the 2011 draft. Find out inside what scout was key to the Pirates drafting Gamache as well as what Gamache has been listening too on his Ipod. With the first pick of the 6th round in the 2011 MLB draft the Pittsburgh Pirates selected infielder Dan Gamache out of Auburn University. In our feature on Gamache we will see that even though his junior year was plagued by injures, including a broken bone in his hand, the Pirates liked what they saw in the infielder. Over the course of his high school and college career, Gamache has been a solid performer everywhere he has played. On defense he has always shown good range and a strong-arm. At the plate, Gamache features a line drive swing, the ability to get on base,and the patience to take a walk. These skills were evident as the Rhode Island native starred as a member of the Bishop Hendricken high school baseball team. Playing shortstop at the time, he was named to the all state team three times in his high school career. Gamache was awarded as 2008 State Champion MVP. After finishing up high school Gamache took his skills south as he enrolled and joined the Auburn Tigers baseball team. As a member of the Auburn Tiger baseball team Gamache continued his solid performance. As a freshman, Gamache made 15 starts all over the infield diamond. He put up a .383 batting average with 3 home runs and 11 rbi’s in only 47 at bats. Gamache would become a full time starter in his second season with the Tigers. Playing primarily at 3rd base, Gamache started 52 of 57 games. Over the course of 189 at bats the slugger batted a solid .365 with 8 home runs and 37 rbi’s. Heading into his junior season, Gamache was poised to solidify his stock among the college infielders that would be draft eligible. The infielders third season at Auburn did not go as planned however. Gamache battled a number of injuries throughout his junior year. Near the end of his season he broke a bone in his hand which led some to believe his draft stock would drop, however Gamache remained positive. The Pittsburgh Pirates liked what they had seen in Gamache and they selected him with the first pick of the 6th round. Gamache had a feeling that there was a good chance that he would be putting on the black hat with a gold P. Pirates area scout Darren Mazeroski ( Son of Pirate great Bill Mazeroski ) had monitored Gamache every step of the way, keeping in touch not only with him but with his coaches and trainers at Auburn. The Pirates believe that once healthy that Gamache can get back to hitting for solid average and can provide them some above average defense at either 2nd or 3rd base. Gamache was one of the 1st players in the entire draft to sign. The Pirates signed him for a reported 125,000 dollar signing bonus. After signing Gamache became accustomed to the Pirates system and allowed his injuries to heal. 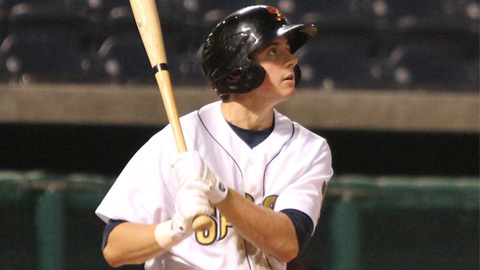 After a quick stop ( 6 games ) at the rookie level the Pirates promoted Gamache to the State College Spikes. With State College Gamache appeared in 20 games starting 9 of those games at 2nd base and 11 at 3rd. Gamache began his transition from the college game to the faster paced pro game. The infielder batted .231 in 65 at bats but did hit his first career professional home run. What was it like being drafted? What were you doing when you found out? Being drafted was an amazing feeling. The nervousness that I had been experiencing all day was finally gone and I felt like i was being rewarded for the sacrifices that I have always made for baseball. Draft day I was home alone with my mom and dad, my brothers and sisters were still in school and when my name was called to open the 6th round when they came off a short break in their draft broadcast it kind of snuck up on us. Did you have any contacts with the Pirates scouts leading up to the draft? Where they one of the teams you thought may take you at some point during the draft? I was in very good contact with the Pirates heading up to the draft. I thought that they may be the front-runner to pick me first because other than the contact Darren had with me, he was also in contact with my trainer at Auburn as well. In my last season of college I had some injuries that I was dealing with and when I broke a bone in my hand at the end of the season I thought there may be some teams that would shy away. Last year was your first year of pro ball. Did you have a difficult transition from the college bats to the pro style wood bats? I don’t think the transition from metal to wood will be that hard. I have been training for years with wood bats and they feel comfortable. I think that the more games I get under my belt in pro ball the more natural it will be hitting with the wood bats in games. During your career you have mostly played 3rd base. With the Pirates do you expect to stay at 3rd or have they indicated to you they may try you at other positions in the future? Even though I’ve played mainly third base I have the ability to play second as well. I will do whatever I have to do to move up the ladder. You have only been with the Pirates a short time but is there any coach or instructor in the organization what has been an influence on you yet? If not what about a past coach? There isn’t really one particular instructor that I can say that have influenced me more than another. To tell the truth all of the coaches in the organization are very in touch with everyone and wants every player associated with the Pittsburgh Pirates to succeed. Every one of those coaches wants to see you in Pittsburgh one day and that is awesome and I think it is unique to this organization. A past coach that was most influential on me is my hitting coach that I started training with when i was 8 years old, Jon Burke. He has always expected the most out of me and had the confidence that I can succeed. What have you done this offseason to keep yourself busy and to prepare for your first full season of pro baseball? This offseason I have spent most of my time in Auburn, Alabama working out and using the facilities at the university. I love this place and I’m grateful for everyone here allowing me and the other pro guys that work out here to use the facilities. It’s easy for me to get motivated to train and now that it is my job to prepare for the season it’s even easier. For all the Pirate fans out there why don’t you tell everyone a bit about your game and your style of play? My game is simple, I want to win and have as much fun as possible when playing the game. If I’m just playing the game and not having fun there is no point to it for me. That said I also play as hard as I can and concentrate on every play and pitch. Favorite baseball player growing up? Favorite non baseball athlete? My favorite baseball player growing up was Nomar Garciaparra, I loved watching him play. My favorite non baseball athlete was Troy Brown of the New England Patriots because he played on both sides of the ball and wasn’t too flashy. Favorite TV Show or Shows? What current music artists are in heavy rotation on your ipod or cd player? I love country music and it takes up most of my iPod. Luke Bryan, Jake Owen, and Jason Aldean are my tops right now. Other than country I like Mac Miller and Drake. A special thanks to Dan Gamache for taking some time out of his off-season schedule to sit down and talk a little baseball with us. Once again please give him a follow at @DGamache10 and follow us at @CTD_Sypien as we follow Dan and others during the 2012 season. Excellent interview… Looking forward to future posts. Oh my gosh, it’s Dan Gamache! We love Dan at AU and wish him the best. Enjoyed reading the article.